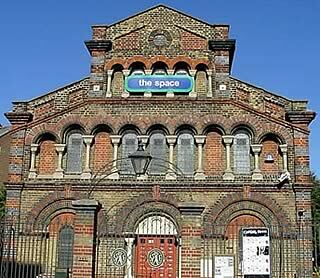 The Space is a community arts venue showing lots of good events, you can watch a play or hear live music. Upstairs is the Hubbub café and bar. Tables and chairs are not fixed to the floor. The box office is open from 2:00pm till 5:00pm on weekdays and 5:00pm till 8:00pm when theres a show on. For performance times its best to got to Spaces website or call them. The Hubbub bar and cafe upstairs is open from 12:00 noon till 12:00 midnight. Call this number to book tickets - 020 7515 7799. You can sometimes buy tickets on the door - but not always! Its best to book in advance. Standard cheaper (concession) prices - people with disabilities, students and unemployed people can save £2.00 - £5.00 off the price of a ticket for most seats. You need ask for cheaper (concession) prices when booking your tickets. The Space theatre is in the same building as Hubbub. It is about 260 metres on the left after the Docklands Sailing Club. Follow this link for a printable map from Streetmap. There are 3 accessible parking spaces, it's a good idea to call up and book a space. After 6.00 p.m. street parking is free. D7 drops you right outside. Jubilee line - Canary Wharf station is accessible for a person using a wheelchair and has an accessible toilet. The Space is approximately 1825 metres (a very long walk) from the station. Mud Chute station is accessible for a person using a wheelchair. The Space is about 750 metres from the station. Masthouse Terrace pier is operated by Thames Clippers. The pier is accessible for a person using a wheelchair and about 230 metres from the Space. There are always staff to help you get on the boats safely. Its best to take the DLR or Jubilee line underground to get to the Space. The entrance doors are 1100 mm wide. There is level access from the pavement. There is a cobbled area outside with a barbeque, picnic tables and umbrellas. There is flat access to all levels and a lift upstairs so it is all accessible. As the Hubbub café/bar is upstairs there is an accessible lift, it is 880mm wide and 1230mm deep. The small lift was not working on our visit, but work is being done on the lift, a good idea would be to call up and check before you visit. They are happy to bring your food and drinks if you ask. There is an accessible toilet on the ground floor, the doorway is 900 mm wide. It is well lit and kept unlocked. There is room for a wheelchair user to move around. A person using a wheelchair may need some help with the door. The staff are friendly and kind, and work hard to make the theatre and café accessible to everyone. Registered assistance dogs are welcome. Have you been to this venue? Rate this venue and our information.